If someone didn’t know who Obama was, he or she probably couldn’t tell that he was the president in the room, some scholars say. Yet Obama’s willingness to be photographed without the typical Oval Office swagger gives birth to a new type of swagger, says Contee of Jack & Jill Politics. She says that photo shows Obama’s self-assurance and leadership style. He seeks out the opinions of his advisers. He believes in collaboration — all while he’s taking down the baddest terrorist on the planet. He doesn’t need to wear a “Top Gun” flight jacket to project strength, she says. True leaders need no swagger. Neither do pastors and church leaders need it. Tagged with Humility, Leadership, Obama, Servanthood. 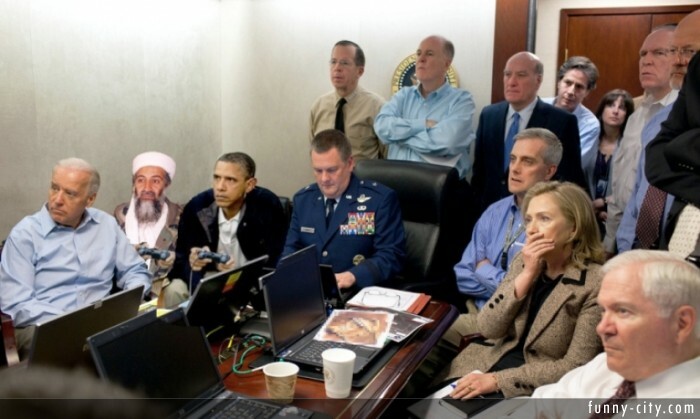 haha, you can make a fake dead photo of bin Laden.